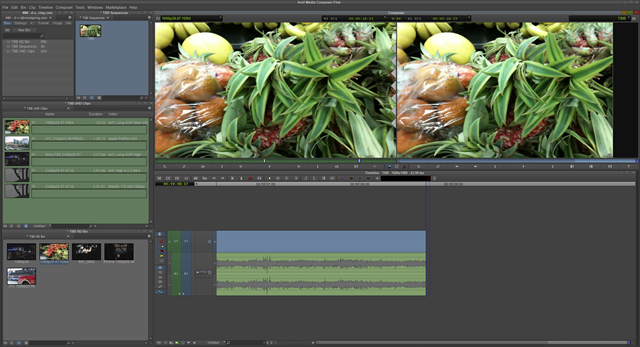 There may be no such thing as a free lunch, but video editors now have a choice among four “free” NLEs. Last year the venerable Media 100 became a free download. Davinci Resolve and Lightworks have been free for years. While waiting for Avid’s release a major question has been in what ways would First be limited to motivate users to pay for the full release. Now that First has been released, we see the major limits are no 4K/UHD export and a very limited selection of export codecs. Although Media Composer | First’s export capability is limited to DNxHD and H.264, this is not a limitation either for those wanting to learn Media Composer or for most who plan to use First for editing. DNxHD 80 is an ideal format for upload to Vimeo or YouTube. An H.264 export can be used when a movie must be played on a computer that has neither DNxHD nor ProRes playback capability. A film festival, for example. To get the feel of Media Composer | First, I decided to put it through its paces by editing a wide range of media: SD, smartphone video, H.264 HD, plus ProRes and H.264-based UHD. 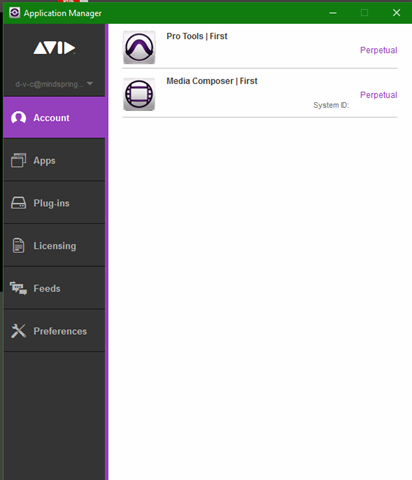 Because Avid is targeting those who have not used Media Composer, I’ll bring you along in my exploration of editing with Media Composer | First v8.9.2. To be more accessible to those who use other NLEs, I’ll focus on traditional 3-point editing. Figure 1: You must sign-in using the Application Manager before you can use Media Composer. Figure 2 shows the initial Media Composer page where you can create a new project or open an existing project. Figure 2: This window has links to learning more about Media Composer | First. Whether you create or open a project, you’ll see an arrangement of Composer windows. 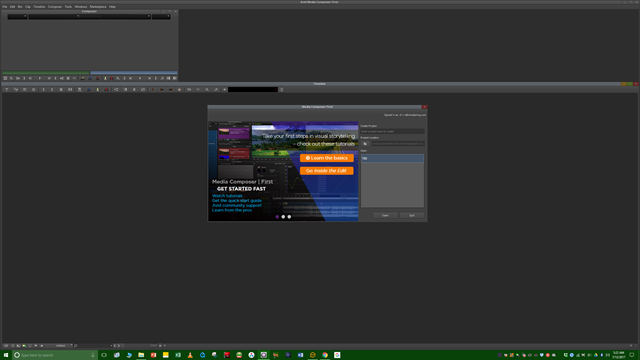 I strongly recommend a computer display of 2560x1440 plus a mirrored 1920x1080 monitor. Now Full Screen Playback mode will present Source or Record monitors in FHD. My free, 154-page Introduction to Media Composer | First (at Scribd) describes how to set-up Media Composer’s windows, workspaces, and toolbars. (Figures 3 and 4.) It also includes in-depth information including the use of MC’s Smart Tools. Figure 3: Composer and Toolbar—left-half. Figure 4: Composer and Toolbar—right-half. As shown in Figure 5, I dragged away the tab for the Clips Bin and re-positioned the Bin. I then created a second (gray) Bin by clicking the Project Window’s New Bin button. Figure 5: Bins—one in Script view and the other in Frame (icon) view. To obtain media, right-click in a Bin and issue the Input > Source Browser command. Locate your media using the Browser. Most SD, HD, and UHD formats can be input by selecting Link mode and then clicking the Link button. Version 8.9.2 provides support for XAVC-S media. If you create multi-stream projects or employ computational heavy FX—select your media files, choose Import mode, and click the Import button to transcode files to 1920x1080 DNxHD (Files > Media Creation Settings: 80, 115, or 175). Transcoding was painfully slow on my system: a Windows 10 PC, with a 3.40GHz i7 6700, an Nvidia GTX-1080, 16GB RAM, and an SSD. (Windows 10 Home can be used.) See Figure 6. Figure 6: Source Browser set for transcode import. First supports up to four video tracks and eight audio channels. An audio track can contain a single monaural audio channel (maximum 8 tracks) or a pair of stereo channels (maximum 4 tracks). Select the Source/Record Workspace by clicking the Toolbar SE button. By default, the initial Sequence will have a Timeline with video and audio Record tracks. To add media to the Timeline, double-click a clip from a Bin into the Source Monitor and trim it by setting Mark-in and Mark-out points. You can record both video and audio by confirming both Source (green) tracks are selected—only video, by clicking the Source audio track to disable it— only audio by clicking the Source video track to disable it. Figure 7: Assemble edit into V1 and A1 tracks. To non-ripple-remove a clip, click the DT/De button to deselect all Record tracks and then select the desired Record track(s). Mark the entire clip by clicking the Toolbar MarkClip button and then click the red Toolbar Lift button. A gap may appear. Now unmark the clip by clicking the Toolbar Clear Both Marks button. 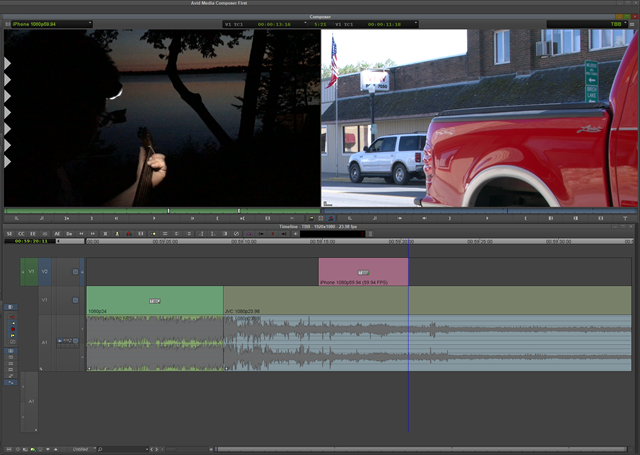 Figure 8: A highlighted clip (blue) that will be ripple extracted from the assemble edit. 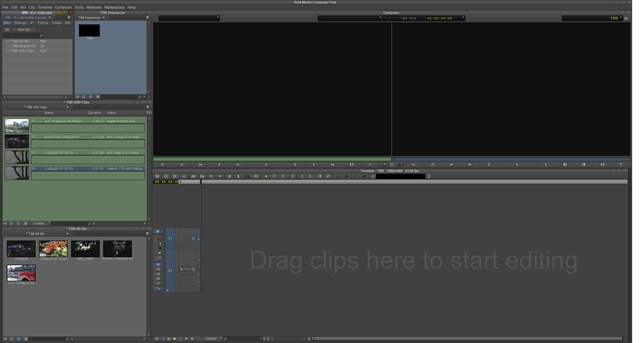 To perform a video-only or an audio-only insert, double-click a clip into the Source Monitor. Mark the insert’s In and Out points. Then, select the desired video or audio Source (green) channels. To add Record video track: issue the Timeline > New > Video Track command. To add Record monaural audio track: issue the Timeline > New > Audio Track > Mono command. To add Record stereo audio track: issue the Timeline > New > Audio Track > Stereo command. Figure 9: Video insert made from Source V1 into Record track V2. Part 2 will cover MC’s Trim Tool as well as the addition of transitions, effects, audio EQ, and titles. 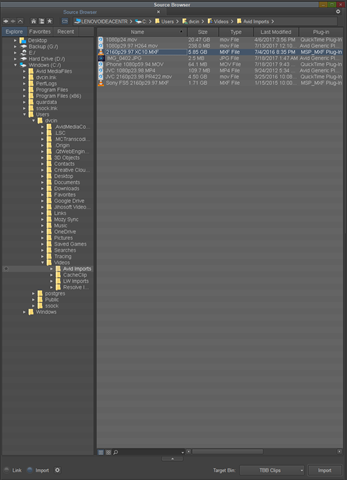 Lastly, exports from Media Composer | First will be detailed.